The 5520 and 5521 Series are low current, high performance, high decibel signals which may be coded or used as a continuous alarm. The 5520 Series is designed to function as either a horn or siren by setting an internal, tamper proof switch. The signal's universal Adaptaplate® mounts directly on walls, or on any single-gang opening. Adaptaplate speeds installation by allowing the installer to connect all field wiring to the plate and then finishing the installation by snapping the horn onto the plate. It also mounts to 3 1/4" (83mm), 3 1/2" (89mm), 4" (102mm) octagon, 4" (102mm) square boxes, or equivalent fittings. The signal may be weatherproofed using the Edwards Cat. No. 349 back box. The 5521 operates as a horn only. It is intended for weatherproof applications and must be mounted on the supplied Cat. No. 349 backbox using the universal Adaptaplate® (supplied). The 5520 and 5521 Series are used for schools, factories, lumber yards, and other industrial and commercial installations. The horn signal is often used for timing, paging, and alarms. 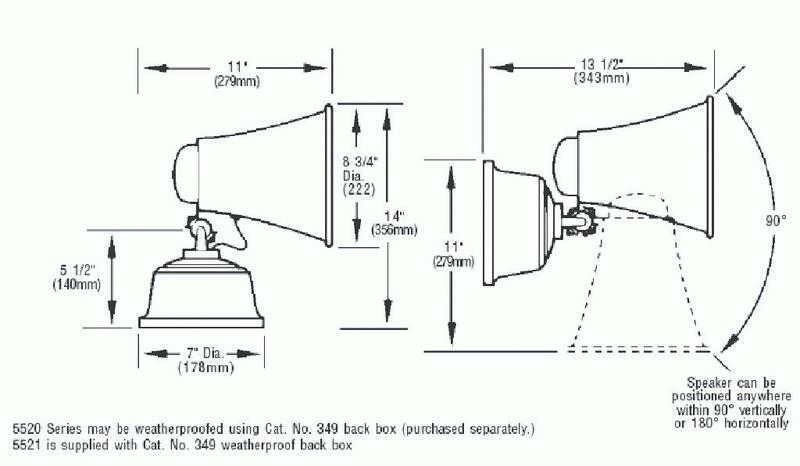 The siren signal is particularly suitable for high noise areas and often used for alerting an evacuation.